Most of us have the same yearly ritual. We march into the New Year armed with a lengthy list of resolutions. In January we join fitness centers and buy the latest fad contraption guaranteed to tone our bodies. We plan to write the next bestselling novel and sell at least a dozen articles. However, after a couple of months, the determination begins to wane. Our exercise equipment is buried under a mound of clothes and we need a GPS system to find our way back to the gym. We haven’t written a word in weeks and stacks of writing reference books are gathering dust in a corner. Resolutions are big on New Year’s Eve, but it’s hard to make them stick around for a lengthy stay. Still, we can use these tips to have a lasting committed relationship with our goals, instead of an empty one-night stand. Unfortunately, vague and lofty aspirations stay vague and remain out of reach. It’s important for us to make our goals concrete and specific. National Novel Writing Month is a good example of a concrete goal. We will write 50,000 words in a month. (Even if we regret 49,995 of them once the month is over). It’s important to find or create a group of like-minded individuals. Additionally, social networking sites make it easy to befriend or follow those with similar interests. Writers can “follow” an array of literary professionals on Twitter, and entering terms like “writing contest” or “seeking submissions” in the search function may result in new opportunities. Our goals are like marathons. If we start out too fast or too strong, we may burn out before the halfway point. If we stay on track we will get to the finish line eventually, even if it takes a long time and a lot of baby steps. Instead of forcing ourselves to finish a chapter, we should try to finish a page. Then keep going. So, let’s all accept the DARE by following these steps. Then, we can celebrate a long-term stable relationship with our goals and move beyond a short-term fling. Two Questions: What are your writing goals? What strategies do you use to keep them? 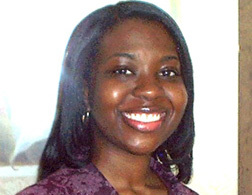 Katrina Robinson is a freelance writer from Virginia. Her publishing credits include articles in V Magazine for Women, poetry in Enchanted Conversation (the Beauty and the Beast issue as well as the Snow White issue), and a story in W.W. Norton’s Hint Fiction Anthology. Currently, she’s attending the Creative Writing and Publishing Arts Program at the University of Baltimore. Follow her on Twitter for information geared toward writers and readers. Thanks for the comment! And thanks to WOW for publishing my post! Two of my writing goals: To submit at least one piece (to a contest or paying market) each month and to free-write for at least 10 minutes a day. My work with FundsforWriters is pretty set in stone with its weekly deadlines, but my fiction takes diligence. I don't broadcast the deadlines I've set for myself, however, because I've read that broadcasting goals and deadlines takes some of the momentum out of our mission. I just don't want to sabotage anything! Hope, thanks for sharing! That's a great point! Let me add that your weekly work with FundsforWriters is amazing and inspiring.